GM - NFLX flashed a pocket pivot on Tuesday, ahead of Wednesday's base breakout, which also occurred on a pocket pivot. NFLX then continued higher from there before reversing slightly on Friday on heavy selling volume. The company is expected to announce earnings on January 18th, and in my view would only be buyable on a pullback to the 10-day line at 127.43. 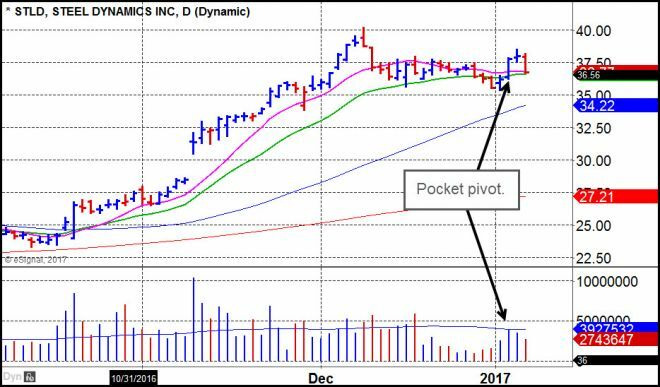 However, Tuesday's pocket pivot was the time to get in on the stock, and now it remains to be seen how much of an upside cushion the stock can generate before its upcoming earnings report. Dr. K - NFLX closed at new all-time highs this past week. Earnings and sales are turning back around as the most recent quarter showed earnings up 71% from the quarter a year ago. Sales also showed acceleration over the last three quarters. While NFLX is challenging AMZN in terms of fresh video content, both companies are challenging Hollywood's outdated paradigm. Consequently, both companies are reaping sound rewards. That said, as always, buy NFLX closer to areas of major support so your sell stop is just a few percent away from your entry price. 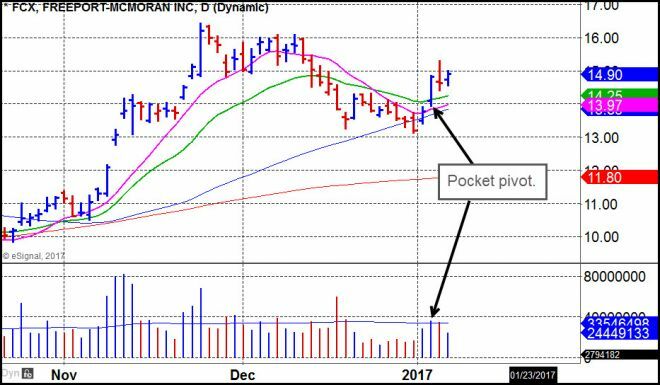 GM - JD keeps flashing pocket pivots along this nearly two-month long consolidation, with the most recent occurring on Wednesday of this past week. JD actually had a second pocket pivot on Thursday as it gapped up off of the 50-day moving average but stalled. It then tested the 50-day line on Friday but traded up and off of the line by the close to hold tight on the day with volume drying up to below average. This remains in a buyable position along the 50-day line. Dr. K - JD has been trying to move higher since November with big volume up days on its ledger, only to reverse back into its base. With Chinese stocks recently coming back to life due to short-term strength in the yuan, monitoring the price/volume action of leading Chinese stocks can be used as a rough guide as to whether JD will finally break out of this sideways consolidation. JD is close to support so is buyable here. GM - QTNA is a recent IPO that makes cutting-edge wi-fi components. Notice how the stock tightened up considerably with volume drying up in the extreme (what we call "VDU" or "voodoo" action) just before flashing a pocket pivot on Wednesday. 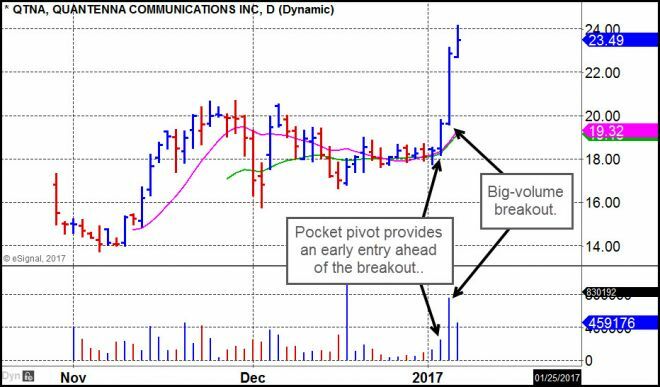 That pocket pivot preceded Thursday's big-volume, 16.26% upside move and base breakout, giving one an early-entry opportunity ahead of the breakout. Pullbacks closer to the 20 price level and the top of the IPO base should be watched for as potentially lower-risk entry opportunities. Dr. K - If you bought this one during the trading day on January 4 since volume was picking up after the VDU action of the prior days, you're sitting on a big profit in just 3 trading days. Keep stops *very* tight as many of these names that lunge higher often reverse a good part of their gains. GM - Steels and other metals posted pocket pivots en masse on Wednesday, and AKS was one of these. It is now pulling into its 10-day moving average as volume dries up, putting it into a lower-risk buy position at the line. Dr. K - Steel stocks have had a very strong post-election run. AKS is right at 10-day support though one could use the 20-day line as a more liberal stop. Keep an eye on the price/volume action of other leading steel stocks such as X and STLD which can serve as a rough guide for action in the steel industry group. 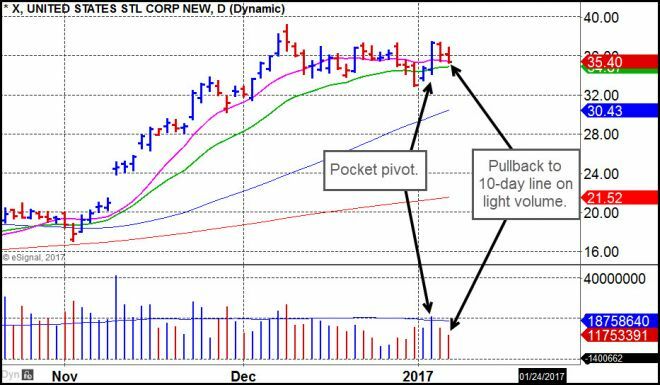 GM - STLD is another steel stock that posted a pocket pivot on Wednesday. Like AKS, it too is pulling into its 10-day moving average as well as its 20-day exponential moving average, which puts it in a lower-risk buy position. 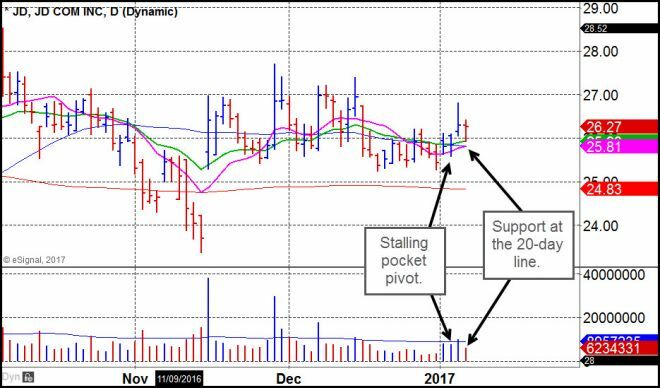 Note that on Tuesday STLD undercut a prior low in the pattern from mid-December and then rallied, leading to a typical undercut & rally move that can be buyable ahead of the pocket pivot once the stock crosses back above the first low. This type of set-up is derived from the work of Richard D. Wyckoff who referred to it as a "spring" type of formation. Dr. K - STLD can be bought here. One could use a breach of the 20-day line as a very tight stop. On the other hand, if one were to use a more liberal sell stop of undercutting the low set on January 3, the loss would still be contained to -3.8% based on where STLD closed on Friday. Keep in mind the 50-day moving average may catch up to the price should this pattern play out in the days ahead, thus the 50-day could serve as an area of support without having to lose more than -3.8% should the trade fail. As noted above, keep an eye on the price/volume in other steel stocks as a rough guide for the industry group as a whole. GM - X is yet another steel that had a pocket pivot on Wednesday. Note that similar to STLD, X also undercut a prior low in its pattern from mid-December when it broke below the 20-day line five days ago on the chart before rallying to the upside. 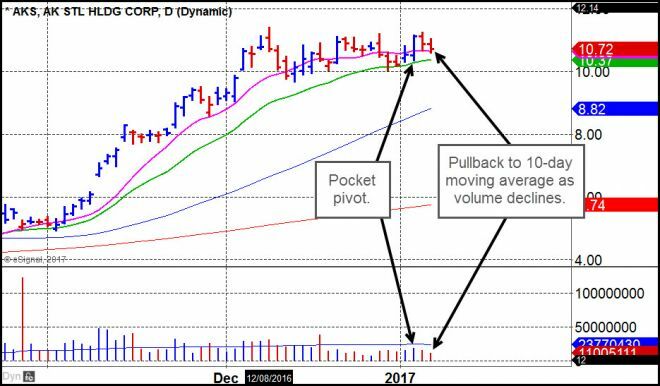 This is a typical undercut & rally type of move, and can be bought when the stock simply crosses back up through the prior low. Dr. K - If one were to apply the same liberal sell stop as suggested for STLD, the loss would be -7% which would not be recommended. Instead, one could use a breach of 1-2% below the 20-day as a rough sell stop to keep losses contained. GM - SQ has been on our Focus List for some time now after posting a mini-buyable gap-up back in early December. 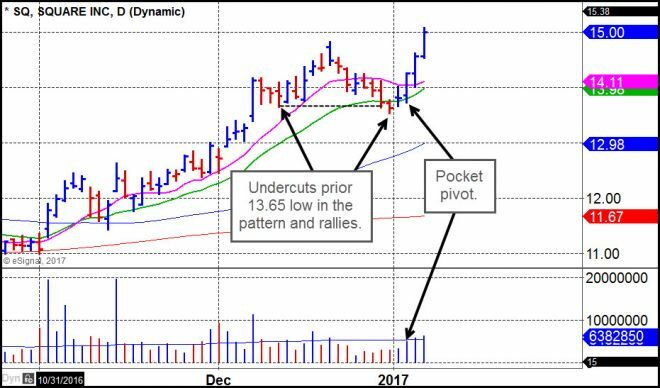 Wednesday's pocket pivot was very actionable come Thursday morning when the stock traded down to the 10-day moving average and the 14 price level and then rallied to post another pocket pivot. It is now extended. Note that SQ undercut its prior 13.65 low in the pattern and then began to rally back above that point just before posting its pocket pivot on Wednesday. This is a typical "undercut & rally" type of move that would be handled by simply buying the stock once its crossed above the prior 13.65 low and then using that low as a selling guide, adding another 1-3% of downside porosity depending on one's own risk-preferences. Dr. K - After working off the gap lower last May by gapping up in August then trading flat for a few months, SQ is breaking out of its recent handle formation. It is extended at current levels so if you already own shares and are looking to buy more or are looking to start a position, wait until its 10-day moving average catches up to its price before looking to buy. GM - MYOV is tightening up here after posting several pocket pivots over recent weeks. In addition to the two current pocket pivots posted over the past six trading days, one can also observe several other pocket pivots in the pattern since early December of last year. This looks like its in a buyable position using the 10-day line as a tight selling guide. Dr. K - MYOV has traded relatively quietly on low volume over the past five days. It looks as if it may try to take a stab at new highs once again. After its pocket pivots on 11/23 and 12/28, it moved higher the next day by almost 20% and 15%, respectively. It had another pocket pivot on 1/4 then retraced back to its 10- and 20-day lines, possibly because it needed more time to consolidate. On Monday, it will have been six days since the big move on 11/29 so with each passing day of quiet price/volume action, the odds increase of MYOV having another big one-day move. GM - FCX posted a nice pocket pivot on Wednesday of this past week. The stock has so far held tight near the Wednesday highs, but a pullback to the 20-day line at 14.25 would provide a more opportunistic entry point, should that occur. Dr. K - FCX business is focusing on copper mining. It is a turnaround play. Since one could use its 50-day moving average as an area of major support, one should buy FCX closer to its 20-day line so losses remain small should FCX drop below its 50-day line. GM - AMZN has been flopping around in what initially looked like a bear flag that extended back to its post-earnings gap-down break back in late October of last year. In fact, AMZN was looking quite weak on the final day of trading in 2015 as it broke to the downside on expanding selling volume. 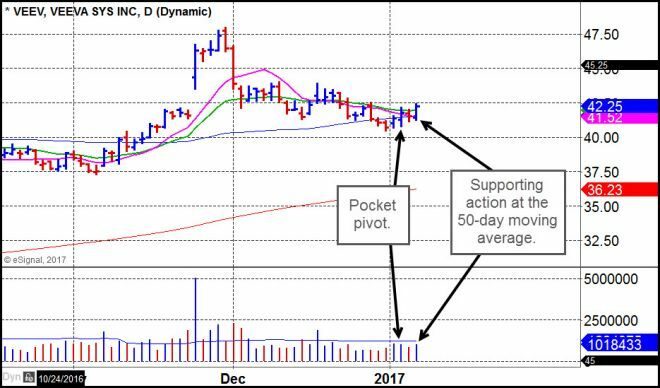 It then started the New Year out by stabilizing at that point, and then over the past two trading days has pushed higher, with Thursday's action qualifying as a roundabout type of pocket pivot on strong buying interest. This is now extended, with earnings expected to be reported on January 26th. Dr. K - Fundamentally, AMZN is well positioned to continue its reign as a leading stock given its dominance in certain areas with stellar growth. The “Alexa Skills” marketplace is one such area in which Amazon has introduced a detail page for every Alexa skill, where customers can take actions like enabling or disabling skills and linking their accounts. This shopping-for-skills concept is great for customers as well as AMZN stock. Thus should the general market continue higher, AMZN should also continue to outpace the broader market. 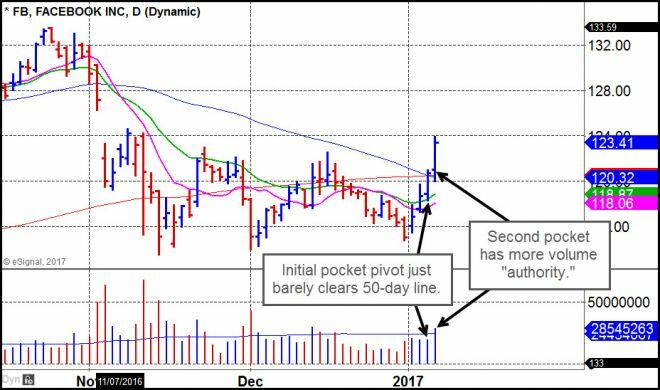 GM - FB is a surprising turnaround, but it was showing very subtle signs on Thursday as it just barely cleared its 50-day and 200-day moving averages on a pocket pivot volume signature. 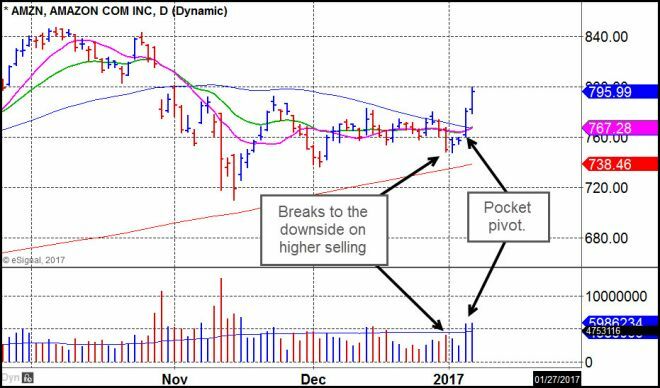 On Friday FB briefly dipped below the two moving averages but found support as volume came pouring in on what became a second pocket pivot that displayed much more "authority" as compared to Thursday's pocket pivot. FB is now extended. Dr. K - Just as with AMZN, FB also had a round-about pocket pivot through a major average. Also like AMZN, FB continues to dominate its space as it rushes to stay ahead of the ever- and fast-changing technological curve. Recent metrics showed FB continues to trounce all other social media spaces including Twitter, LinkedIn, and Instagram by at least 4:1 in terms of website traffic and number of users. GM - VEEV has been pulling back following a big-volume gap-up breakout in late November. It may now be rounding out the lows of a new base formation. 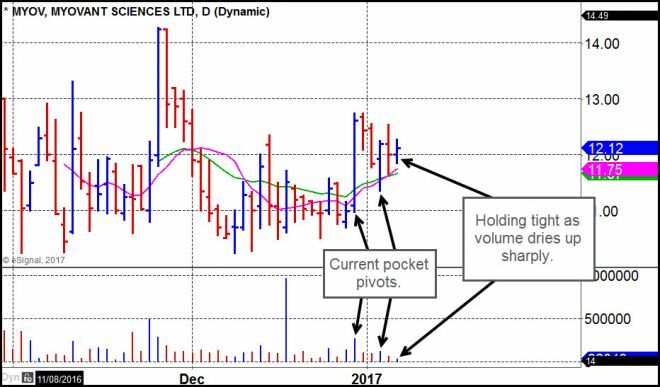 The stock posted a roundabout type of pocket pivot on Wednesday, held tight on Thursday as volume dried up a little bit, and then moved higher on Friday on expanding volume after briefly testing the confluence of the 10-day and 50-day moving averages where it found ready support. 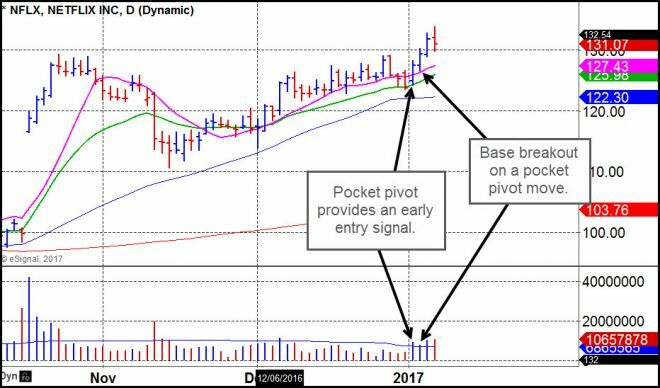 Dr. K - VEEV gapped higher on its prior earnings report then eventually fell back to its 50-day moving average where it got support. Price/volume action around its 50-day was quiet. This was a clue that despite VEEV trading below its 50-day for a couple of days, it was not surprising to see VEEV retake its 50-day and head higher. VEEV is still buyable at current levels with a drop placed either just under its 50-day or, more liberally, below the low on 12/30.